Why did I go to see this film? Oh yeah, because it's science fiction and it stars Hugh Jackman. I think Rotten Tomatoes described it best when they labelled boxing robots as a "silly premise". That meant the film ended up with a 59% score but the movie rating site was also right when they called this a well-made Hollywood film. Clocking in with a budget of $110 million, this is a finely crafted cinematic treat but in using the word treat, keep in mind that the target audience would be those we love, for instance, the Transformers. Somehow I think you have to 14 years old and are still playing with toys and stuff. No? But, but, but I must be quick to add that we have a half decent story of Dad abandons girlfriend and son then Dad reunites with son. While I may dismiss the premise as silly, the story of Jackman and the boy pulls all the right heart strings. There are silly robots but there is also some good acting on the part of Jackson and the rest of the cast. It's almost like parents who take their kids are not going to die of boredom watching crazy machines box each other. The story for this film comes from a 1956 short story written by this American author and screenwriter. The story was first published in the May 1956 edition of The Magazine of Fantasy and Science Fiction. However it would seem that this film is not the first time this story has been filmed. Matheson adapted it as an episode of The Twilight Zone called "Steel" which first aired on October 4, 1963. The name Matheson may be unknown to the average person but his work is probably not. The 2007 film I Am Legend starring Will Smith is an adaptation of Matheson's 1954 novel of the same name which, by the way, was the third adaptation of this novel. One of the more famous of the 1950s science fiction films was The Incredible Shrinking Man based on Matheson's 1956 novel. And, I have to add that one of my favourite Twilight Zone episodes Nightmare At 20,000 Feet was written by Matheson and starred none other than William Shatner. Small world, eh? If you're an adult and you're standing at the theatre looking up at the marquee trying to decide on what movie to see, don't pick this one. If you're a parent taking your kids, you'll have an okay time. When this comes out on DVD and you're thinking about renting something for Saturday night, there are, ah, a lot of better films out there. Life is short; don't waste it. Why did the producers make this film? Well, to make money. With a budget of $110 million, I'll be curious to see if the investors get their money back. I'm advising you to let those investors seek their profit in the foreign markets. This is an okay film more for kids or somebody who digs the Transformers but I am not recommending it. There are better movies to see. Silly premise notwithstanding, this is a well-made Hollywood movie: Thrilling and exciting action with just enough characterization. Real Steel is a 2011 American science fiction action film starring Hugh Jackman and directed by Shawn Levy. The film is based on the 1956 short story "Steel" by Richard Matheson, though Levy placed the film in U.S. state fairs and other "old-fashioned" Americana settings. 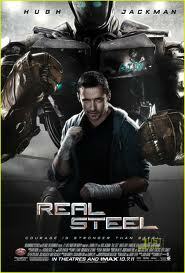 Real Steel was in development for several years before production began in June of 2010. Filming took place primarily in the U.S. state of Michigan. Animatronic robots were built for the film, and motion capture technology was used to depict the brawling of computer-generated robots. Real Steel was publicly released in Australia on October 6, 2011 and in the United States and Canada on October 7, 2011. It will be in both conventional and IMAX theaters. Richard Burton Matheson (born February 20, 1926) is an American author and screenwriter, primarily in the fantasy, horror, and science fiction genres. He is perhaps best known as the author of What Dreams May Come, Bid Time Return, A Stir of Echoes, The Incredible Shrinking Man, and I Am Legend, all of which have been adapted as major motion pictures. Matheson has also written for several The Twilight Zone television show episodes such as "Nightmare at 20,000 Feet", and adapted his 1971 short story Duel into a screenplay later that year for the Steven Spielberg directed television movie of the same name. "Steel" is an episode of the American television anthology series The Twilight Zone. [It is written by] Richard Matheson based on his story, first published in the May 1956 edition of The Magazine of Fantasy and Science Fiction.